Arriving on the Clyde on Monday was the Liberian-flagged tanker HELLESPONT TRIUMPH, a ship built in 1998 and which was named PECOS when new. She was built by Daewoo in Korea, and is 157,406 tonnes deadweight, with an overall length of 274 metres. Unusually for a tanker, her hull is painted white - this was done at a recent drydocking in Dubai. 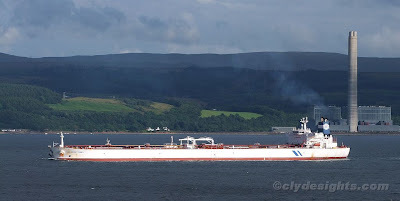 HELLESPONT TRIUMPH, operated by Hellespont AG, a German company, was carrying a cargo of Nigerian crude oil.